Awww….what an adorable coat. This baby leopard print on this faux fur coat just pulls at your heart strings. The ruffled dropped waist of this coat includes enough length to create the perfect lines when worn with dresses for that special occasion. The button up front and matching hat finish the design perfectly. 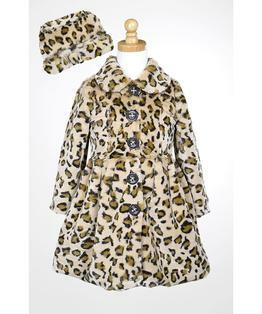 Super-soft faux fur with animal print on the outside and a comfy plush micro fur lining for softness all around. Button Front. Machine washable. 100% Polyester. Includes hat.